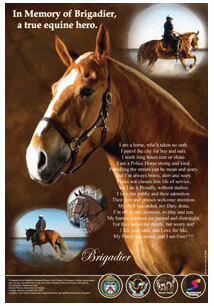 The memory of Brigadier continues to be honoured with the printing of a beautiful poster. A tribute, both in images and word, is made to Brigadier, the police horse that died in the line of duty on Feb. 24, 2006, in the 24" x 36" colour poster. It is available for sale with proceeds going to the memorial fund created by the Toronto Police Service and the Ontario Veterinary College (OVC) following his death. "We are deeply touched and honoured to accept gifts in memory of Brigadier," said Dr. Elizabeth Stone, OVC dean. "There is nothing quite like the bond between rider and horse." All proceeds go directly to "The Brigadier Memorial Fund" at the Ontario Veterinary College to support clinical care for horses at the Large Animal Clinic. The printing of the poster has been graciously donated by Sportswood Printing in honour of the memory of this special equine hero. •	By credit card online, under the section of the donation form headed "I would like to donate to", please select "Other" and specify "The Brigadier Memorial Fund at OVC".